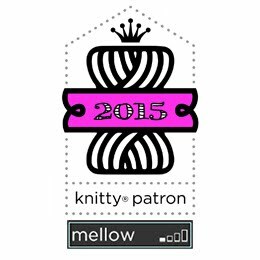 Margaret Blank: Thoughts from a Textile Artist: Friday so Soon? What you see above is two sides of the triangle, laden with baskets that hold fabric and batting. Across the space between the two sides I've hung a caddy for my threads. 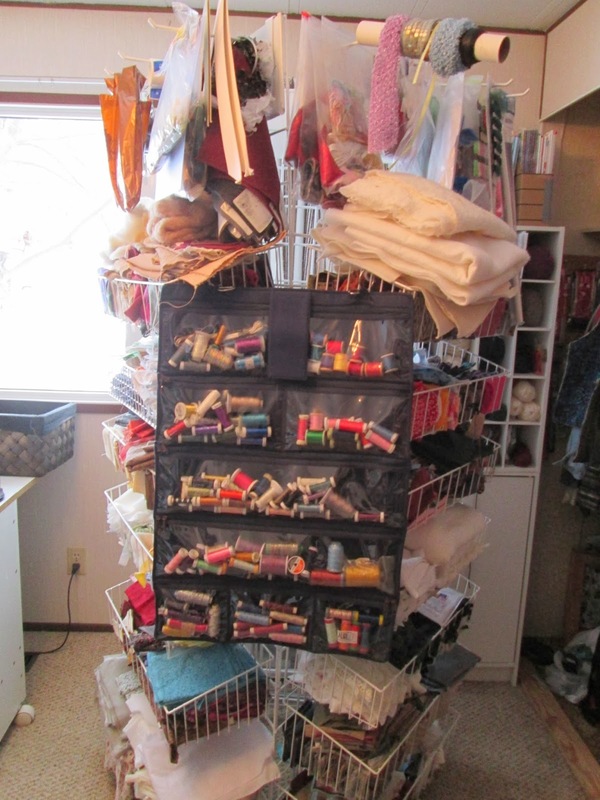 On the tops of each side you see the hanging hooks for bags of ribbons and trims, threads, etc. And here's what it looks like -- sans baskets and hooks -- at an art show -- in this case, the Lacombe Art Show and Sale in April of this year, in which I shared the booth space with my photographer daughter. We hung pieces on both sides of the 3-piece stand, and I used a basket for my miniatures, each of which were in clear plastic envelopes. In addition to these three facilities, I have several stacking plastic bins (with drawers), 3 under my cutting table and 1 next to the above-mentioned Sears cabinet. I also have a barrister's bookcase (the kind with lifting glass doors) and an open bookshelf for my books. Magazines are in magazine holders (cardboard), labelled. For easier access, I took off the old sliding closet doors and had their track covered with a solid piece of wood. In the closet space are two dressers -- one solely for yarn, and a smaller one for fabric and embroidery linens and kits -- and the shelves hold another cubby with yarn, several of my project/online class binders, more magazine holders etc. So you see, I have my choice of fibre fun wherever I choose to spend my time! 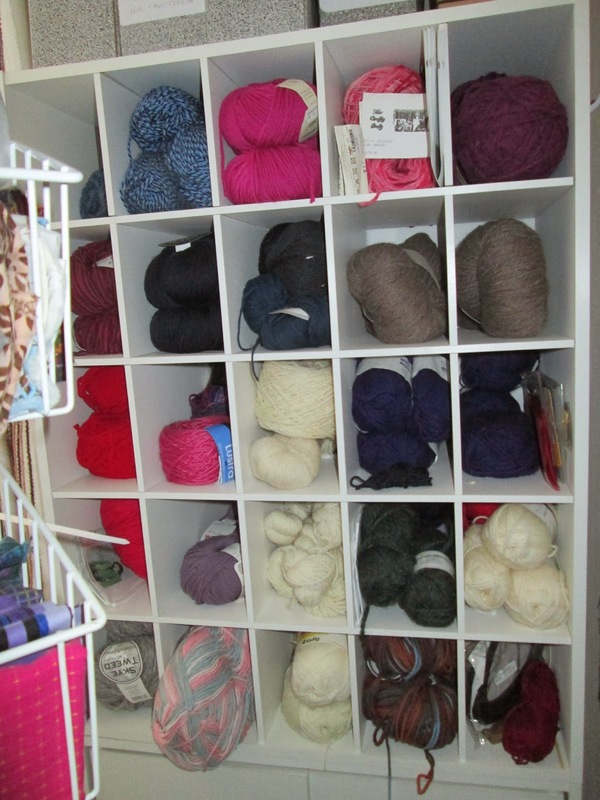 Your lovely shelving holding your yarn is art in itself! Wonderful to be able to have your yarn on display for inspiration. What a great buy. That wire rack and basket system is awesome! I need a shoe keeper to hang behind a door for my weaving yarns. It would be a great solution for me. 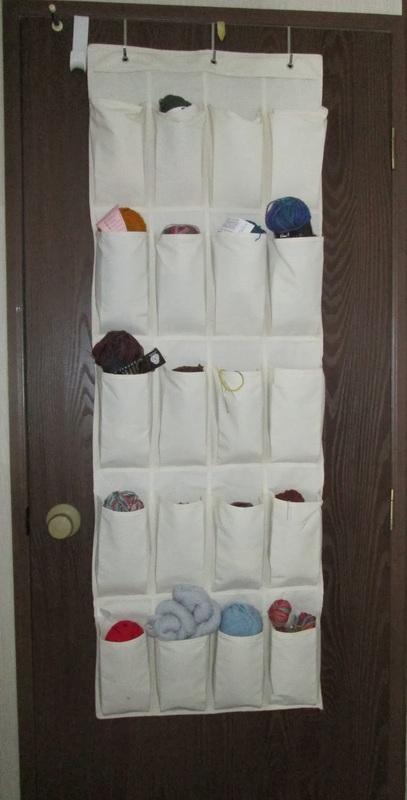 Shoe organizers are becoming very popular with crafters. You have wonderful storage ideas here! Great to see some of your work space. I laugh at the other craft corners. I too have other work spaces, my chair area, my laundry room, More in storage. I love that you've taken over the house with your supplies! I kind of did that, unofficially.